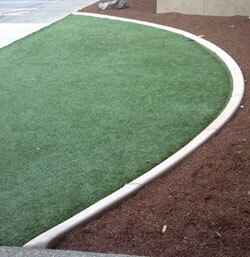 Many people around the Lacey area don’t know how affordable custom concrete edging really is. It is often assumed that because of the quality look that it provides, custom concrete edging is a thing only for the wealthy. Curbzilla is offering a free design consultation, and incredible value on our custom concrete edging products. Along with our low pricing, you also are receiving a product that will virtually eliminate ever having to edge your lawn again. Our Concrete edging can even be used to keep plants with quickly spreading traveler roots at bay. With a possible depth of up to 36 inches, our concrete edging is a perfect way to beautify your landscaping while protecting the barrier between your lawn and garden. Are you sick and tired of having to re-edge your lawn each spring? Wouldn’t it be nice if your lawn mower would take care of creating a perfect edge every time you mowed? With landscape curbing from Curbzilla, all this wishful thinking can be a thing of the past! With our Mower style landscape curbing, you’ll be able to mow quickly and easily without ever needing to edge trim again. Why Choose us for your Lacey Landscape and Garden Borders? Curbzilla was founded as a company on the belief that a quality product done right the first time, at less of a profit; is more valuable to us than a quick buck off of a shoddy job. Each of our craftsmen is highly experienced in what they do, and are committed to the Curbzilla way. We believe that the project isn’t truly done until we have made sure that our customer is satisfied. Call Curbzilla today for a free estimate and let our design team work with you to help show you all that your yard really could be. Call Curbzilla today!